Attribution on the web is a controversial topic; ideas, stories, videos, graphics are copied and pasted over and over again, propagating their way across the virtual universe. As an entrepreneur and blogger, I am always pleased when I see my articles shared on other sites, or linked to in the social media. While I would prefer for all of those readers to come over to our blog to read the piece, I certainly understand the value of additional reach that can be gained when my posts are re-published elsewhere or when others discuss ideas I may have written about first. The negative comes when those posts or ideas are used without any attribution whatsoever. The formula for plagiarism on the web is sometimes as simple as copy+paste=post. Last week Maria Popova, the founder of brainpickings.org was interviewed by Brooke Gladstone of NPR’s On the Media about her latest creation, The Curator’s Code. 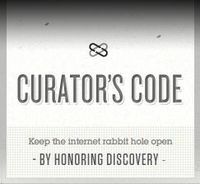 The code, created in collaboration with Tina Roth Eisenberg of swissmiss.com is their attempt at a structure to govern online usage and attribution. The code is a straightforward way for an author (or curator in some cases) can give honest and proper attribution not just for a source, but also for “inspiration.” It works by sorting all attribution into to basic categories, the “via,” which is the original content that the author is reposting, quoting, or paraphrasing, and the “hat tip,” which is the secondary source where the author may have first learned of the primary material, idea, or article. Simple and elegant, Popova and Eisenstein have created an uncomplicated method for visually and ethically providing attribution where attribution is due. You can listen to the entire interview here or read the transcript here.